Save an extra CDN$ 8.96 (26%). Buy the Kindle Edition instead. Start reading Spinning Silver: A Novel on your Kindle in under a minute. Not so much a reworking of the Rumplestiltskin story as new fairytale, under which the hints of the original fairytale can be glimpsed. A woman charged on pain of death with transmuting silver to gold by a greedy king is a central plot pivot, along with the power of holding a name, but male and female tropes have often been playfully and skillfully inverted, and the cultural context of medieval Jewry adds depth and poignancy. In the end it was another strong and satisfying work from Novik, and it left me wanting a further exploration of the magic of debts and contracts. A dry, boring style that would probably serve better for academic papers than for a novel. A challenge to keep awake while reading it. A bit slow in the middle the action at the end is good though. I personally liked uprooted way better. The varying point of views was also a bit confusing. Not nearly as fun as Uprooted. Small town people, city folk, non-humans, all dance together in this driven novel about family and love and rage and politics. Fewer deaths by far than her Uprooted, and deeper than her dragon series, it’s my favourite of hers so far. Set in a sort of Russia of an earlier age with boyars and dukes and tsars as well as walled cities and Jewish enclaves. I kept falling into the story and reading on and on until I was interrupted or I hit the end. Definitely recommended. High Fantasy. Engaging characters. Changing viewpoints. The world is more complex than it seems, onion-like. Re-read it immediately after finishing, and found that the most delightful thing is how the POV of a young child is done, very cleverly and well but without hitting you over the head with technique. It was lovely to read a book where the evil is mostly a giant Rube-Goldberg trickle down effects, gradually revealed through changes in POV. The most evil actions are reactions to previous actions that vary in their evilness. 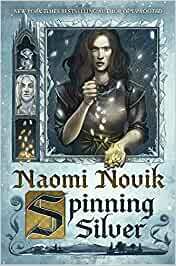 Another spectacular fairy tale retelling from Naomi Novik. While it looks and feels like it could be a continuation to Uprooted, the book is more of a spiritual successor. The same themes of love and loyalty found in Uprooted are here, but Naomi Novik has expertly woven underused ideas of debt, commerce and promises. While it does have elements of the Rumpelstiltskin fairy tale, there’s so much more, including Slavic mythology and even the myth of Hades and Persephone. The characters aren’t perfect, but that is what made me love them all the more. There were so many surprising twists and little plot seeds planted throughout that came fruition in ways that I found very satisfying. If you like high fantasy deeply entrenched in culture, you’ll love Spinning Silver.